Nothing beats pairing brunch with a fantastic bloody mary, and no other city does it like Milwaukee. Whether its a cure for the common hangover, or just pleasing to the palate, bloody marys are a staple accompaniment to any serious weekend brunch. The best bloody marys use a perfectly balanced house-made mix, occasionally with interesting twists, and always topped with tasty snacks that make the drink more like an appetizer rather than just a strong cocktail. Here’s our list of the best Bloody Mary’s in Milwaukee! Milwaukee takes the bloody mary pretty seriously. While just about every place offers them, a few restaurants stand out for offering a variety of really delicious bloody marys topped with flavorful bites and always paired with a creative beer chaser. 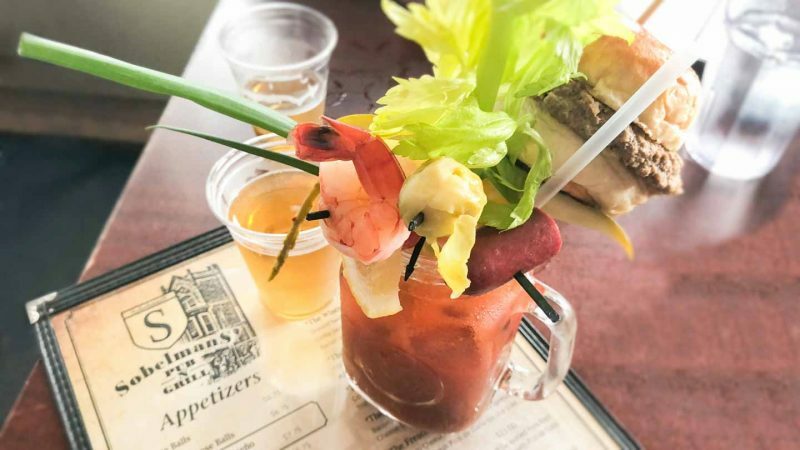 Read below for a guide to the Milwaukee’s best bloody marys. Located in the Historic Third Ward, Wicked Hop has been around for years and continues to please customers with a really cool dining experience and fantastic food. Housed in a restored industrial building, with exposed cream city brick walls, and two levels of dining, Wicked Hop is one of those places that locals love to take out of town guests. They also have great drink specials, like a happy hour from 11am-7pm Tuesday through Friday, and all day on Monday, with $1 off beer and cider, and $6 select cocktails and wine pours. The food at Wicked Hop is basically elevated bar food, with awesome nachos, wings, sandwiches, and a great brunch menu. The bloody mary at Wicked Hop has been voted the city’s best numerous times. The classic comes with house-made mix, a cold shrimp, mozzarella whips, a smoked beef stick, kosher dill pickle, olives, pickled mushroom and brussel sprout, and a Lakefront Riverwest Stein beer chaser ($10, $8 for virgin or without toppings). Some diners may choose to go with the famed “Glass” Slipper, a plastic 96oz. boot filled with the classic bloody mary and accompanied by six chasers (price varies). If you finish it, the “glass” is yours to keep. Sobelman’s is one of the most popular burger joints in the city. The original location is housed in a historic tavern in an otherwise industrial part of town. The location aside, the burgers were so good the restaurant quickly formed a cult-like following. It didn’t take long before Sobelman’s established two more locations in the Milwaukee area, one on Marquette’s campus and one north of the city in Mequon. The restaurant offers excellent appetizers, mostly consisting of really amazing fried foods, and of course, top-notch sandwiches and burgers. When it comes to grabbing a bloody mary at Sobelman’s, the best accompaniment is the Hangover, with Colby-jack cheese, bacon, fried onions, and a fried egg ($10). Beyond famous burgers, Sobelman’s is also known for some of the best bloody marys in the city. In fact, the Sobelman’s bloody mix is popular enough it now is offered in stores. Head over to the restaurant though for the real experience, where you can choose from eight different options. They have a classic bloody mary with simple toppings, and from there the choices get increasingly original, like getting a cheeseburger slider on top ($13), fried bacon-cheese bites ($12), to group bloody marys like the Beast with garnishes, sliders, and bacon wrapped cheese balls ($45). The most famous group bloody mary takes the Beast and also tops it with an entire fried chicken ($60). 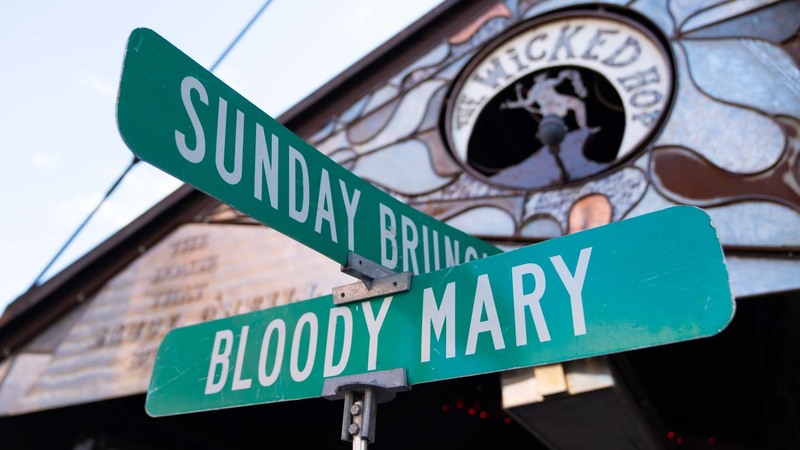 From simple to crazy, Sobelman’s has you covered with excellent bloody marys. For the most popular brunch served daily in Milwaukee, head over to one of the Blue’s Egg locations, either on the west end of the city or in Shorewood. The food at Blue’s Egg ranges from simple breakfast items like pancakes, though done really well, to really creative omelettes, stuffed hashbrowns, sandwiches, and super delicious twists on benedicts, like the Florentine with poached eggs, spinach, tomato, english muffin, and hollandaise sauce. There are always daily food specials worth ordering as well, in addition to tasty coffee drinks, beer, and cocktails. With such great brunch food, it should come as no surprise that Blue’s Egg offers an excellent bloody mary. The Blue’s Bloody Mary comes with Black Dot vodka, tangy tomato juice, spices, bacon, and a Miller Lite chaser ($9). The vodka can also be substituted for a veggie-infused vodka that gives the bloody mary a really unique twist. Try the Blue’s Bloody Mary next time you head over to Blue’s Egg for breakfast. Address: 317 N. 76th St. Address: 4195 N. Oakland Ave.
Cafe Benelux is a Belgian-inspired restaurant and bar in the Historic Third Ward serving up an enormous beer menu and really tasty low-country inspired cuisine. The restaurant itself is also awesome, with abundant indoor seating, cafe style seats lining the sidewalk, and a rooftop dining area perfect for drinks in summer. Food ranges from brunch items to interesting burgers and steaks, making Cafe Benelux the perfect spot to please everyone if in a larger party. The beer menu is also awe-inspiring since it seems like they have hundreds of beers to pick from. However, if you forego a beer on your trip to Cafe Benelux, you may just end up with one of the best bloody marys in the city. Cafe Benelux takes their bloody marys really seriously, which may come as a bit of surprise since the beer options take precedence. There are actually seven different bloody marys to pick from, all with different levels of heat, toppings, and liquors. The Traditional is simple yet delicious, with house bloody mix, pickle, carrot, and olives ($8). From there the options get more creative, like the Southsider, with peppercorn-infused local Rehorst vodka and jalapeno-stuffed olives ($8). The Milwaukeean is also great, with local vodka, bloody mix, horseradish, beer, bacon, and cheese curds ($9). 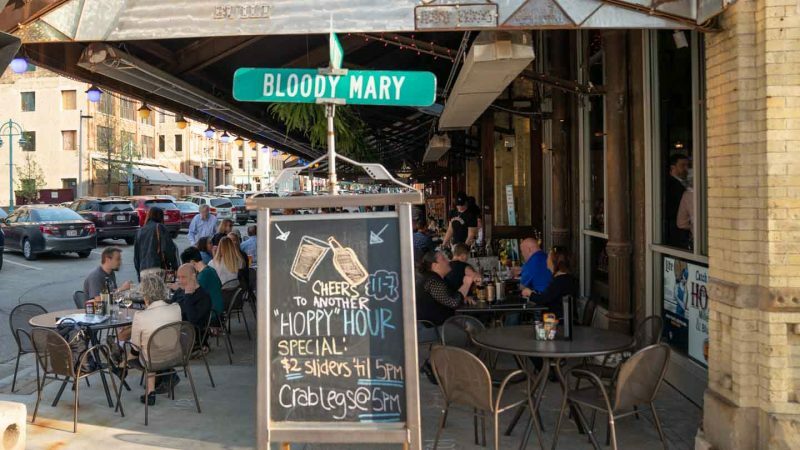 For a nice selection of creative and well-made bloodys, head over to Cafe Benelux. Located on Milwaukee’s east side, Comet Cafe is a retro diner, dessert stop, and bar all rolled into one. The kitchen opens early and runs through midnight serving up creative spins on classic diner dishes like meatloaf, along with a bunch of interesting vegetarian and vegan options, in addition to great breakfast foods, like tofu scramblers, jonii cakes, sandwiches, and burritos. The double sided bar at Comet also provides great drinks and drink specials, like Tuesday $4 classic cocktails, Wednesday buy one get on whiskey specials. On Sundays, though there is always a line, Comet transforms into one of the hottest spots for brunch in the city, especially since they offer free bacon. The bloody mary at Comet Cafe is one of the most popular drinks they serve, especially on Sundays since it pairs so well with free bacon. The vodka bloody mary has a house blend, adds a touch of Guinness beer, and is garnished with bacon and other pickled treats. The $7 bloody also comes with a 7oz. mini Miller High Life, which you’ll need since the bloody is a bit on the spicy side. If you don’t mind waiting for a bit to get a table, head over to Comet Cafe for some awesome food and a really excellent bloody mary. Address: 1947 N. Farwell Ave.
County Clare Irish Pub is attached to a small boutique hotel on Milwaukee’s east side. When it comes to best Irish pubs in Milwaukee, County Clare definitely makes a strong case for being number one. The cozy interior comes with a warming fireplace, wood booths, and a small but comfortable bar. Their regular menu features Irish staple dishes, like shepherd’s pie ($17.95), and they offer a full brunch menu on weekends, offering classics like a full Irish breakfast with bangers, black and white pudding, Irish bacon, tomato, mushrooms, and brown bread with choice of potato ($15). Along with tasty Irish beers and craft cocktails, County Clare Irish Pub also has one of the best bloody marys in Milwaukee. The bloody mary at County Clare is certain to cure just about any hangover, especially when coupled with any of the brunch items. The staple bloody mary comes with a house mix, smoked beef stick, a red potato, cheese, olives, a pickle and lemon wedge, comes in an awesome goblet-style glass and comes paired with a beer chaser choice ($8). For an interesting twist on the classic bloody mary, try it with Guiness beer and whiskey instead of vodka. 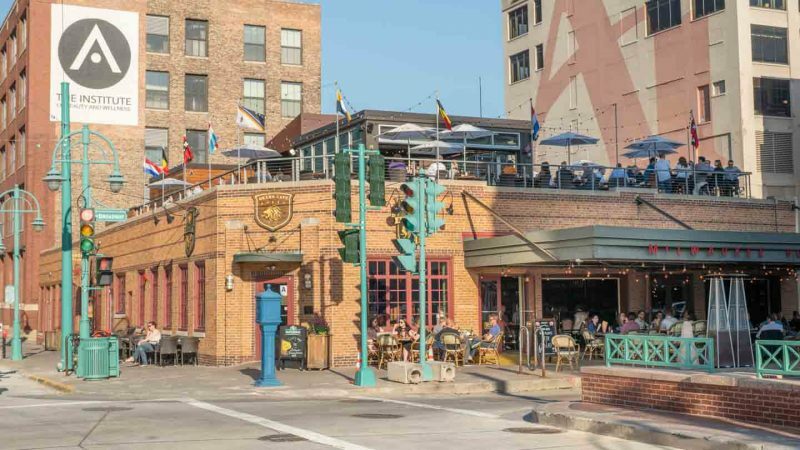 Address: 1234 N. Astor St.
Merriment Social, located right between Walker’s Point and the Historic Third Ward, is one of Milwaukee’s most popular restaurants. 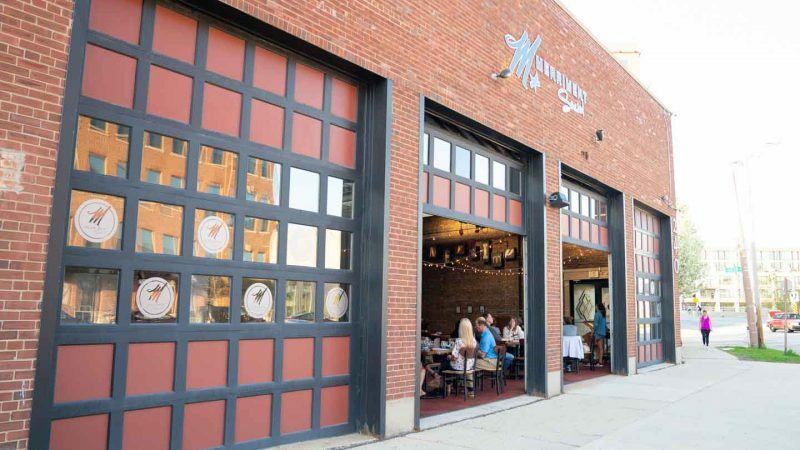 With a lengthy bar and abundant seating, and really neat garage doors that let the fresh air in during summer, Merriment Social boasts a great environment with a top quality menu to match. Their dinner menu features great burgers, sandwiches, various types of fried chicken, and really creative salads. The restaurant also has a tasty brunch on weekends. Try the fried chicken with waffles, topped with honey butter and maple syrup, and you definitely will not regret it ($18). Beyond great food, Merriment Social also has a great cocktail list, boozy shakes, and of course, a wonderful bloody mary. The bloody mary at Merriment Social is simple but really tasty. Topped with traditional ingredients, like olives, pickles, cheese, and sausage, the house mix is a bit spicy but well-balanced and really delicious ($8). For something a little more unique, try replacing the regular vodka with either the jalapeno-infused vodka or the rosemary and garlic-infused vodka ($9). If you have the day off, consider going with their bottomless bloodies special ($18). With great food and the possibility of having bottomless bloody marys, there is ample reason to get over to Merriment Social. Address: 240 E. Pittsburgh Ave.
AJ Bombers is one of Milwaukee’s favorite destinations for high quality and creative burgers. 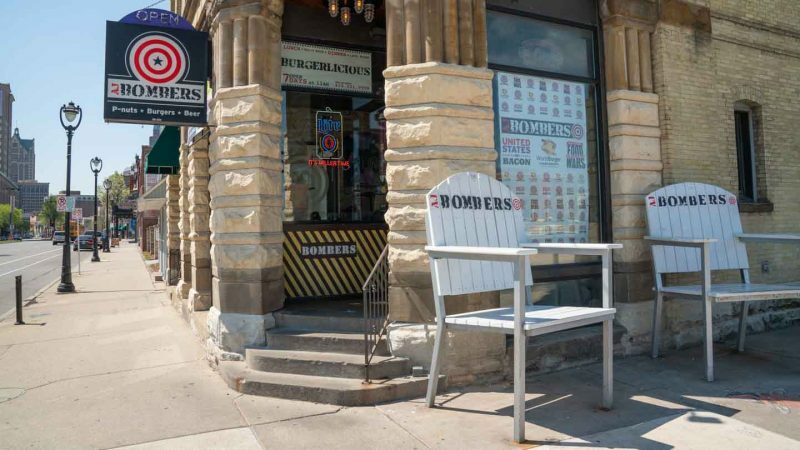 With one location downtown and another in Wauwatosa, AJ Bombers offers really good food at a reasonable price. They offer excellent appetizers, like the cheese curds ($6.50), and a menu of creatively topped burgers. Try the Bomber Burger with a quarter pound patty and a mushroom stuffed with American, cheddar, and muenster cheese ($9.50). The restaurant also features a comfortable bar where you can try a variety of beers or craft cocktails, in addition to boozy shakes and an excellent bloody mary. The bloody mary at AJ Bombers pairs well with one of their outstanding burgers, especially when starting a Sunday fun day. The Bloody Bomber comes with a tangy house mix, an AJ Burger strip with cheese and bacon, plus a pickle, olives, and paired with either a miniature Miller High Life or Miller Lite ($8.25). The house mix elevates the bloody mary to a superior level, and the toppings definitely solidifies the Bloody Bomber as one of the best in the city. Located on Milwaukee’s west end, Story Hill BKC is a popular choice for breakfast, lunch or dinner. The restaurant features a small wine store, and ample seating for dining. They also have a great happy hour from Tuesday through Saturday 2pm-6pm where you can get $2 off all taps, which includes cocktail taps, and $5 select wine pours. The menu at Story Hill BKC is really creative and incorporates lots of locally sourced ingredients, which is certain to please especially when paired with one of their excellent cocktails, wines, or beers. Especially if stopping in for breakfast or weekend brunch, the bloody mary is a really good choice at Story Hill BKC. They have two really great options. The first, the Story Hill Bloody Mary, has vodka, house bloody mix, cheese, olive, pickle, sausage, and a Miller High Life shorty chaser ($8). You can also substitute regular vodka for vegetable-infused or bacon-infused vodka, the latter being especially delicious. The other option is the Garden Variety Bloody Mary, with vodka, bloody mix, pico de gallo, hot pepper, olives, sausage, pickles, and a Miller High Life chaser, which is a great option if looking for a little spice. Either bloody mary is a great choice when hitting Story Hill BKC for breakfast. Address: 5100 W. Bluemound Rd. Uber Tap Room is one of the best stops in the city when it comes to trying various Wisconsin cheeses and beers. The tap room, which adjoins a cheese store, is located on Old World 3rd Street, right in the heart of a major entertainment district with restaurants, bars, and the Fiserv.Forum. They offer a great happy hour with discounted beers, though the hours sort of vary based on whether special events like a Bucks game is going on. Either way, stop in for a giant pretzel ($14), sandwiches, brats, or one of the cheese boards where you can try a variety of locally made cheeses. The Deluxe Bloody Mary at Uber Tap Room is one of the best in the city, and pairs perfectly with one of the cheese boards or a brat. It comes with salami, cheese, lemon and lime wedges, pickle, olives, and a miniature beer chaser with your choice of beer ($12.95). Besides for the super tasty toppings and a really well-made house mix, one thing that sets the bloody apart at Uber Tap Room is how good the staff is about adjusting heat levels. Want no heat, or something super spicy? Just let the bartender know and they always seem to hit the heat level right on the mark. For a bloody mary with great toppings with a heat level adjusted to your palate, head over the Uber Tap Room. Address: 1048 N. Old World 3rd St.
West Allis Cheese & Sausage Shoppe is a great destination for visitors to Milwaukee. 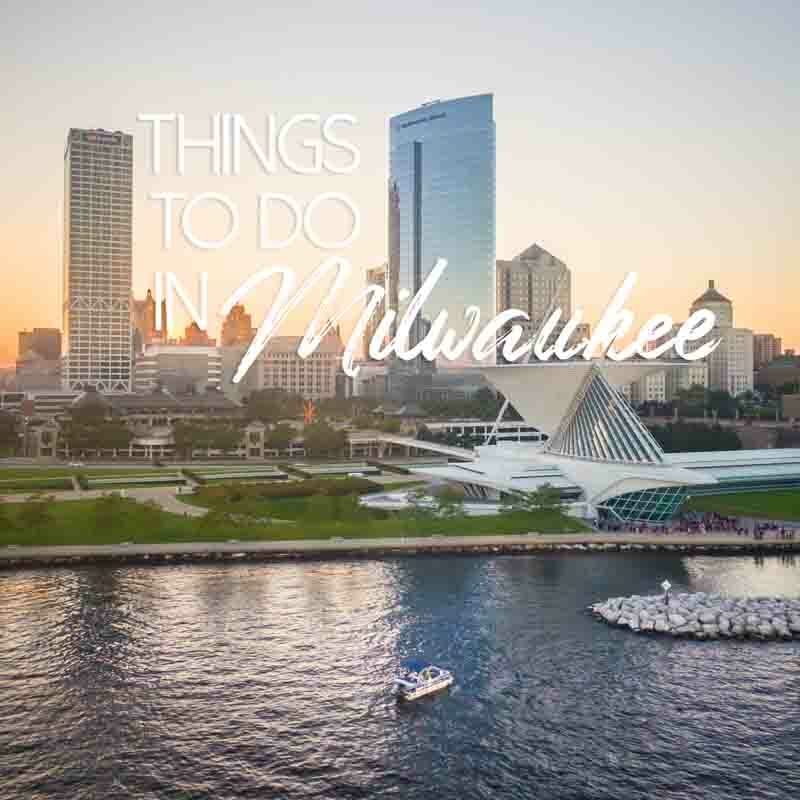 They offer two convenient locations, one in West Allis, the other in the Milwaukee Public Market. Both offer numerous store items like deli meats, smoked sausage, cheeses, in addition to a counter-service restaurant where you can grab excellent specialty sandwiches and breakfast items. Especially if looking for a tasty lunch and the opportunity to grab some food-related souvenirs, then West Allis Cheese & Sausage Shoppe is an ideal all in one stop. Address: 400 N. Water St.
Top 9 Hotels Near Fiserv Forum – 2019 Rated!